**This month’s Trending with The Ton post has been postponed to Tuesday, September 29. Hello, Rubeena here welcoming you to the another amazing Coffee Lovers Blog Hop! The Ton is proud to be a super sponsor and flash sponsor for this blog hop, too. Linking up to the hop will give you a chance to win one of the THREE $10 gift certificates to The Ton shop. One of these will be a flash prize so it’ll be announced sometime during the hop and the remaining two prizes will be announced on the wrap-up post for the Coffee Loving Cardmakers Blog. Be sure to link up! You’ll have until Friday, October 2 at 11:59 p.m. PST (3:00 a.m. EST). I have two cards to share with you today. Effie designed the coffee cup and the two sentiments for me to use on the cards for this special event. 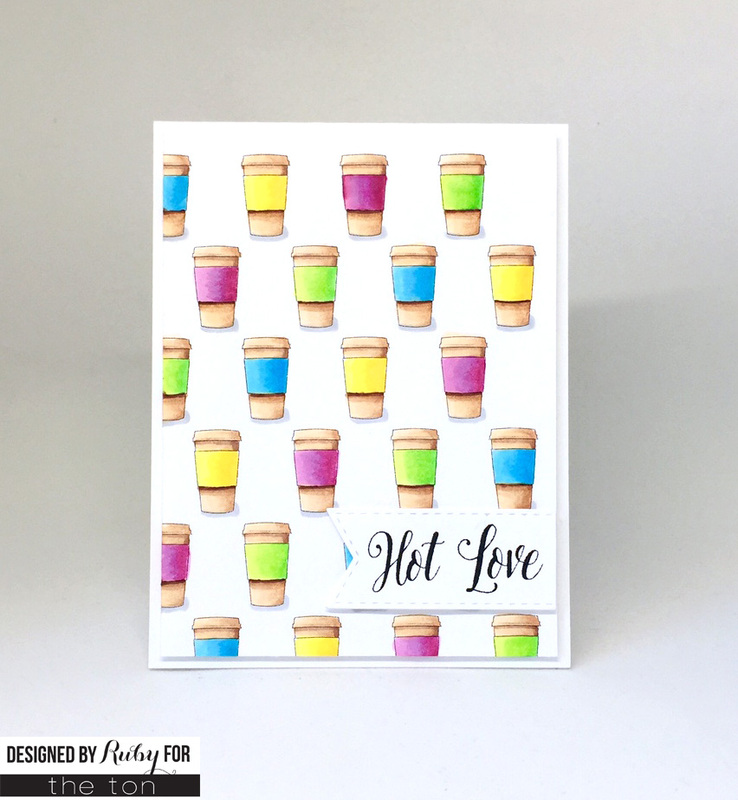 For the first card, I used the cup to create a background that I printed and cut to 4″ x 5.25″. I used Copic markers to color all the cups. I attached it to a white card base with foam tape and added the sentiment, too. Since I wanted to show off all the bright colors, I kept the background as the main focus. 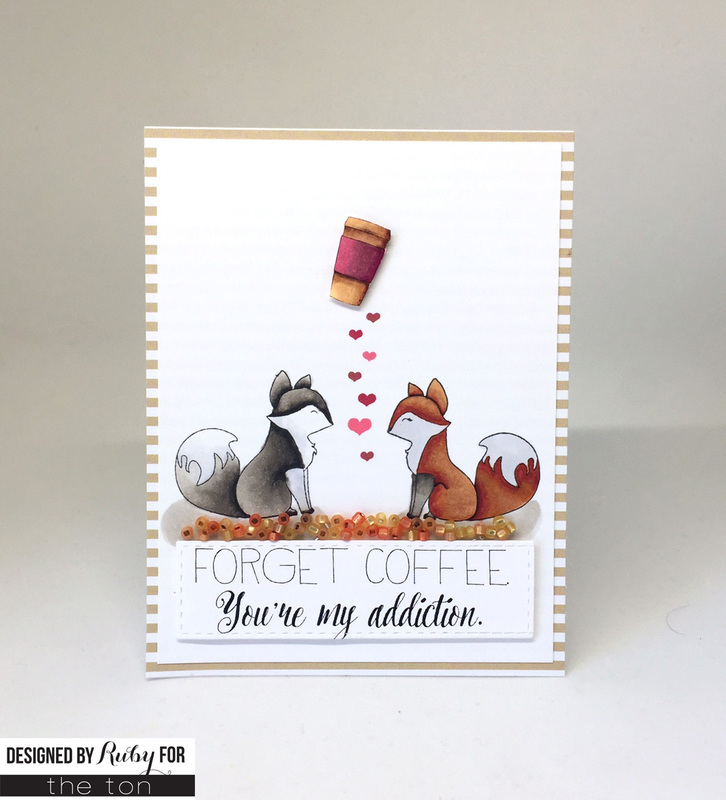 For the second card, I used Hey Foxy and the Changing Leaves Couture Mix since it is a fall-themed Coffee Lovers Blog Hop. I stamped the two fox and colored them with Copic markers and stamped some of the hearts between them. I printed out the sentiment and a coffee cup, which I colored with Copic markers and fussy cut. I matted it down above the hearts with some foam tape. I added the sentiment below the fox and added beads from the couture mix to imitate fall leaves. That’s about it for me. Thank you for stopping by! Be sure to link up a fall-theme coffee or tea card to the blog hop for your chance to win one of the MANY prizes, including the three $10 gift certificates to The Ton. Enjoy all the inspiration! 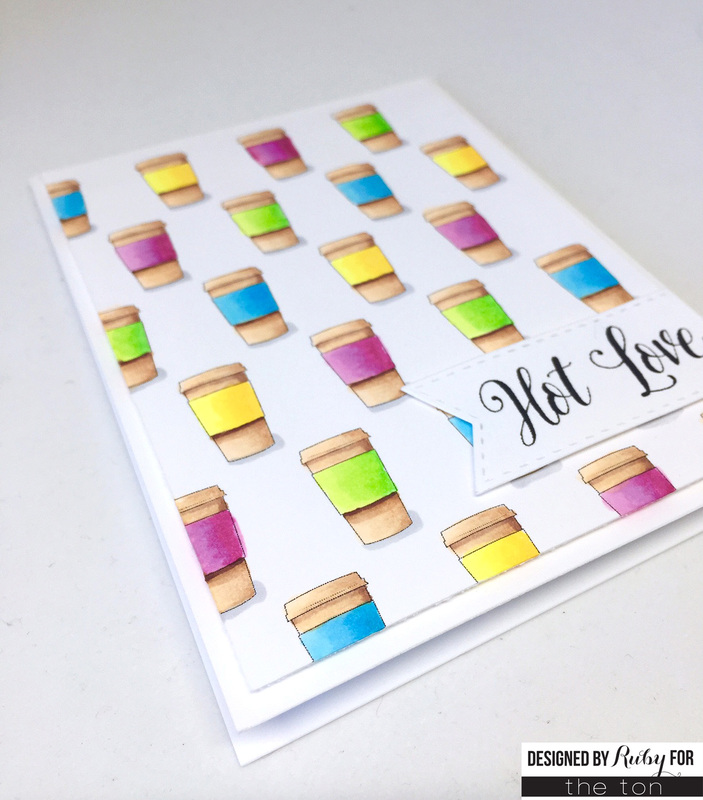 Oh wow love your cards, the colourful cups is my favourite. Awesome cards! The background you created on the 1st card is super cool, and I 100% can go with the theme of the second. TFS! TOOT SWEET mini coffee cups all the colors of the bow!!! 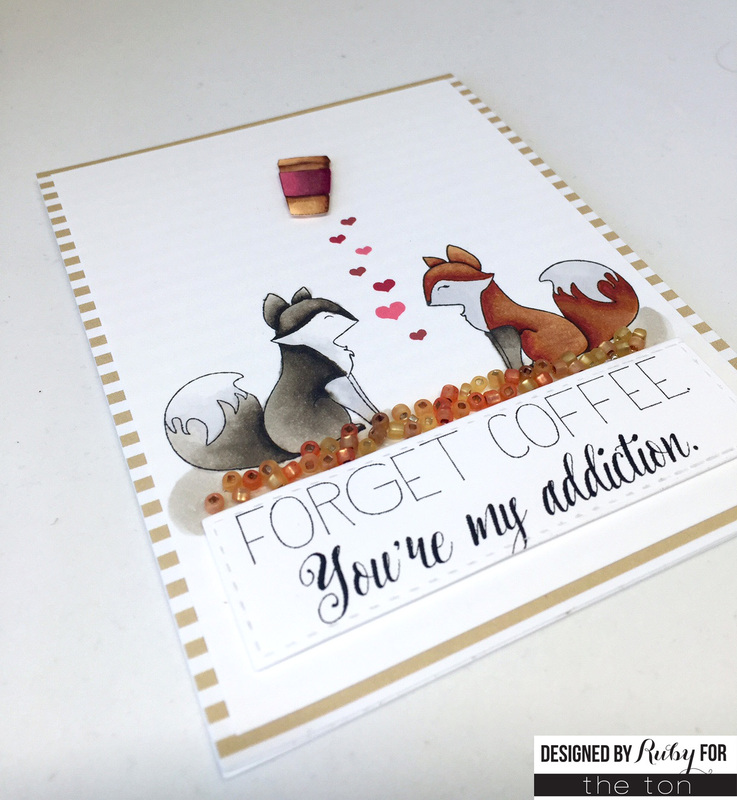 Cute foxes as well:) LOVE that ” Your’e my addiction” sentiment!! Super to see The TON as a sponsor for the Fall CLBH! Such Beautiful cards!! Thanks for sponsoring!!!!!!!!! I LOVE the multi colored coffee cups on the first card. amazing. I especially love the beads used as leaves. gorgeous! Beautiful cards,so elegant,sweet,gorgeous and very special! Such great cards!!!! Hot Love……lol…. So fantastic. Thanks so much for being a sponsor!!! What beautiful creations.. both! I love all of the bright colors on the first and those foxes are so pretty on the second… just beautiful..
Those cards are AWESOME!! The touch of beads for fall leaves is such a cool idea! loved the sentiment too. Thanks for sponsoring! Okay, so two great cards. I like how you colored all the coffee cups. Too cute. But the two foxes are just so adorable with that sentiment. GREAT cards. Awesome images, fabulous coloring, fantastic cards! Love them!!! Thanks for sharing and for being a sponsor! thanks for sponsoring! love your cards! ohhh divine the cards, love it colors!!! Both cards are wonderful! Just browsed your stamps, they are amazing!!! Thank you for being a sponsor. Wow really like these cards and the stamps you carry. Awesome cards, thanks for being a sponsor! Two fabulous cards! Thank you for sponsoring this fun hop. Two very different cards…summer hot colors still good with a hot cup of coffee, even in Arizona at 110-117 degrees. I have a fox stamp and never thought of putting it together with coffee. Thank you for sponsoring an amazing hop.